*Added a few more whims to the Aspiration's whim list. 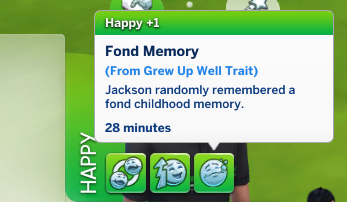 *The Fond Memory buff is a bit more common. 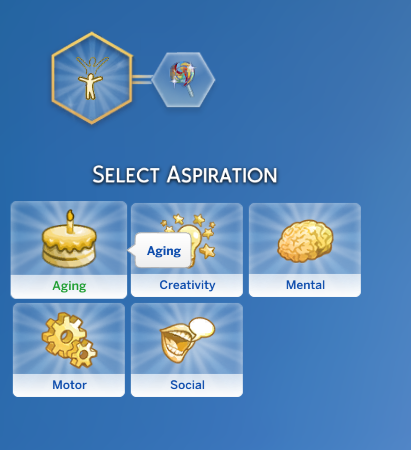 *The Grew Up Well trait now effects City Living careers. *Made it a little easier to get through the Monkey Bars objective for Bothersome Brats. *Added a new buff; Fun Childhood. *Changed the Play On The Monkey bars objective name, points given, and description. 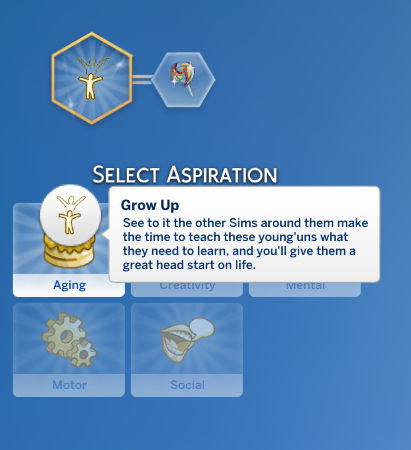 The Grow Up aspiration from The Sims 2 is back! 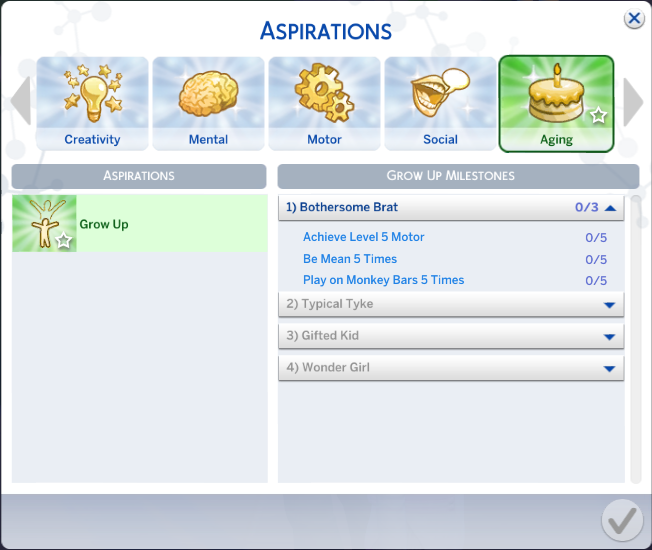 Thanks to Zerbu's awesome Mod Constructor I have recreated the Grow Up aspiration. The original aspiration had 6 levels, but since I can't do that I cut the last and first level. When creating each level I pulled from the name and the original aspiration's wants. In the end, each level sorta become a mini-version of the other child aspirations. The aspiration will give your child whims; though none of them are new whims. Basic things, like Read Something, Level up a skill, Play with Toys, etc. 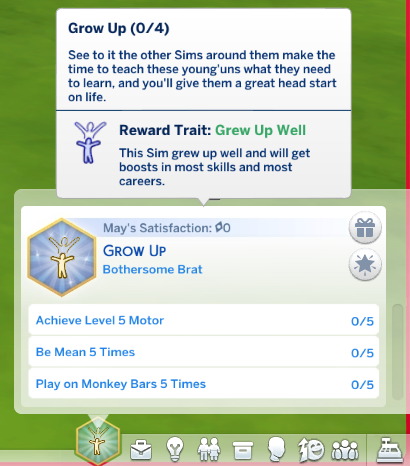 With this trait Sims get boosts in every career. Except Criminal, if you grew up so well, why turn to a life of crime? These sims actually do a poorer job in the career than other sims. They also will get boosts all skills. Except Mischief, they do a little worst in it, just a little. If they're still in Grade School, be prepared for some big grade improvements! And High School won't be too hard for them either. Also, Child Skills are a piece of cake now. 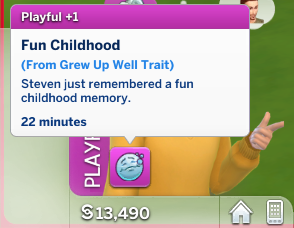 This trait also triggers 2 buffs, Fond Memory and Fun Childhood. 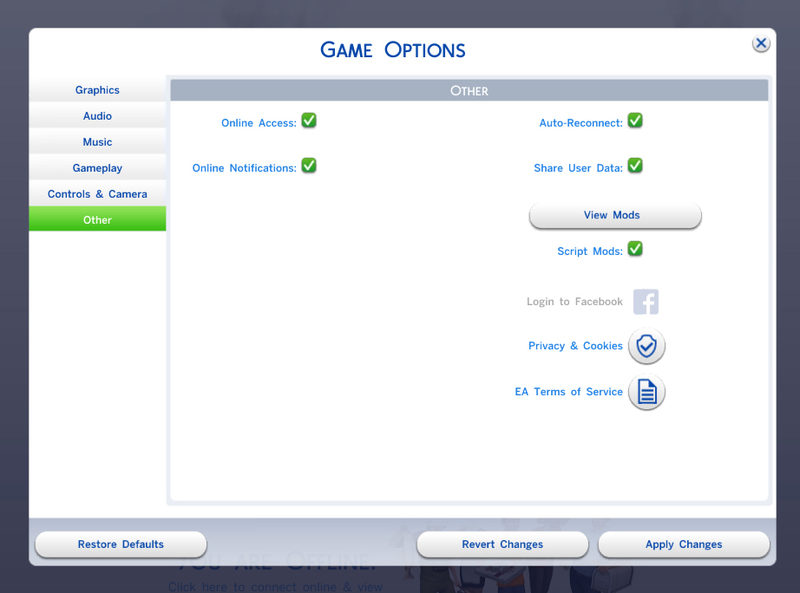 Both only appear if the Sim is a teen or older. The Fond Memory buff will give a boost in every skill (except Mischief) and is a Happy buff. The Fun Childhood buff is a Playful buff, but it doesn't give any special boosts. Both only appear for 1 in-game hour.